On March 8-9, 2017, we joined our customer at the unveiling of their Virtual Reality Data Center Rack Design Exhibit at Open Compute Project U.S. Summit in Santa Clara, CA. Our customer is a fortune 500 company that designs and builds intelligent products for a connected world. They provide innovative design, engineering, manufacturing, real-time supply chain insight and logistics services to companies of all sizes and industries. 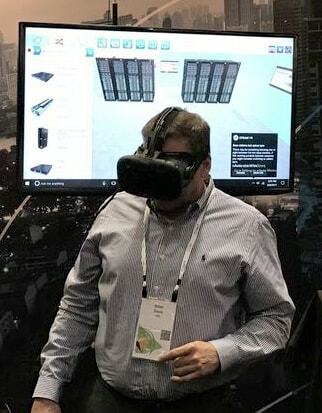 The company featured a virtual reality (VR) station for OCP conference attendees to visualize and explore data center rack designs equipped with storage and network products. The virtual reality experience, powered by Powertrak VRoom, transports product designers, architects, and executives directly into a virtual data center facility where they can explore the room and interact with servers, storage, and power supply products inside a rack. The OCP U.S. Summit 2017 is a two-day event for individuals and organizations to share their intellectual property and collaborate with the OCP community to progress the future of IT projects. It features a lineup of speakers, announcements, demonstrations, booths and networking opportunities. 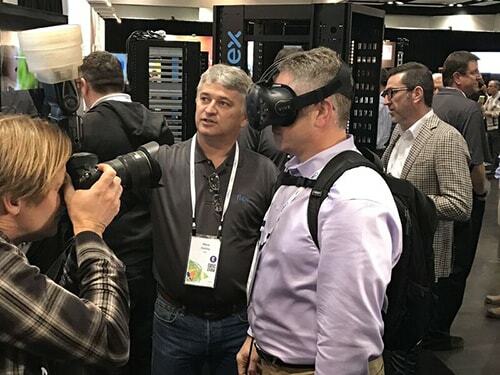 The company welcomed attendees to its booth for 1:1 demonstrations on configuring data center racks using Powertrak 2D and 3D Product Configurator, then experiencing the design in virtual reality. This immersive, interactive experience showcases how racks are designed, components connected, and how the layout fits in the environment. Our customer's investment in innovative technologies like VR and configure-price-quote software exemplifies why they're the best manufacturing partner in the world. Their fully digitized and optimized manufacturing process ensures accurate configurations and pricing; resulting in consumers buying higher quality products at a lower cost.